Home /Best White Sneakers Under £50? White sneakers are a key staple in any man’s wardrobe, but if you’re like me… you’ve probably gone through a few pairs. I started off wearing Air Force Ones, then vans, then converse, then Stan Smiths, but recently I’ve found myself without a pair in good condition. Fellow white sneaker wearers, you might be able to relate here. Keeping white sneakers white is hard! Fresh out of the box they always look great for a while, but after lots of wears and also after wearing them in unsuitable occasions (playing football at the park in them) they get ruined. Those white sneakers now worn with jeans don’t look as crisp as they used too. 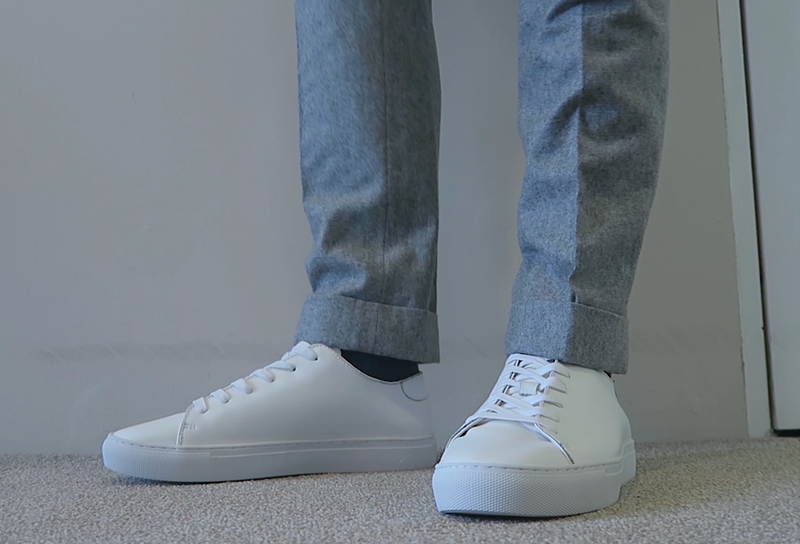 So I went on the hunt to find a versatile, pair of minimal leather sneakers for under £50. A pair I could dress up and dress down and a pair I could call my new go to. 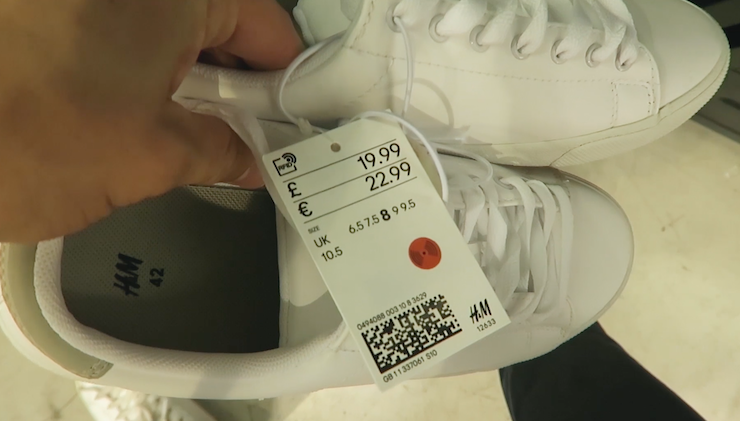 In this article and video, I take you on that journey to find the best white sneakers for under £50. White sneakers are often the go to sneaker for most men. Get yourself a good pair and you can wear them casually with jeans and a t-shirt but you can also dress them up, embracing the modern day suits and sneakers trend. As stylish men building a versatile wardrobe is imperative, and the white sneaker is one of the most versatile items you’ll find. I’ve spoken about the importance of shoes before, and focusing on what’s on your feet has a big impact on your overall style. Even though a loafer, a brogue or a monk strap will add more elegance and ‘style’ to an outfit, at times focusing on comfort is needed. Good style is comfortable style. 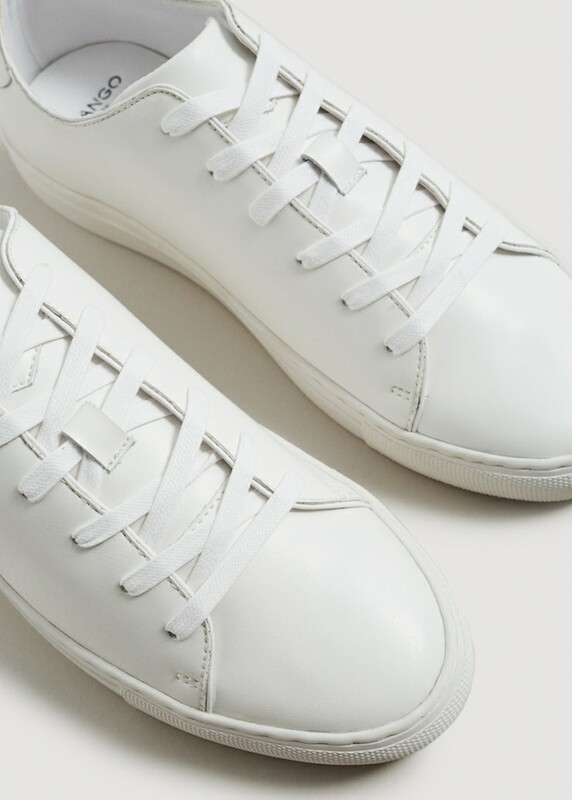 A minimal, leather, well constructed white sneaker will go with most outfits but it will also last you a long time if looked after. There’s an array of styles to choose from for an array of different brands. 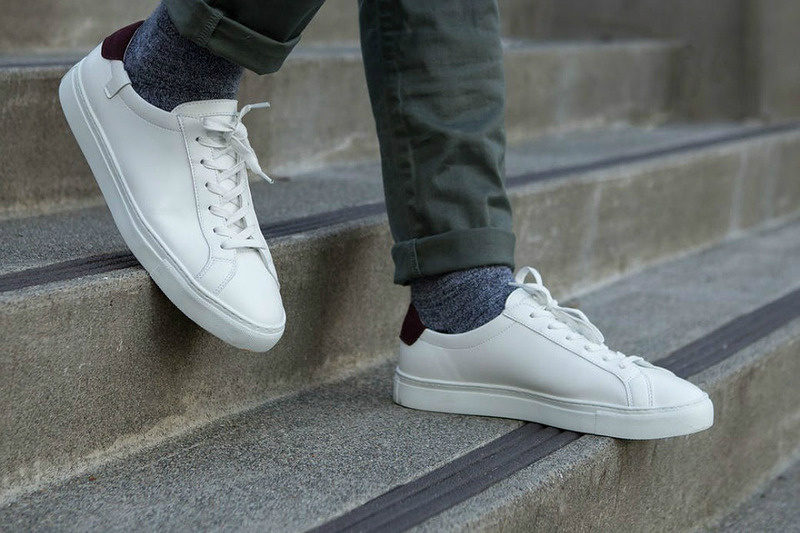 Key styles include converse, Nike’s, Common Projects and the classic Adidas Stan smiths but you can also pick up white sneakers from almost anywhere. Any high street retailer will also stock them, with pairs from as little as £15 from retail giant H&M. So what white sneakers do you choose? Again, for me it comes down to versatility. You can of course go for something more ‘sporty’, channelling the popular Athleisure trend right now but a leather pair seem to work better with formal attire. As with anything you buy, you have to think about your personal style and also day to day lifestyle. Are you looking for a pair of white sneakers to wear to work which requires a casual dress code? 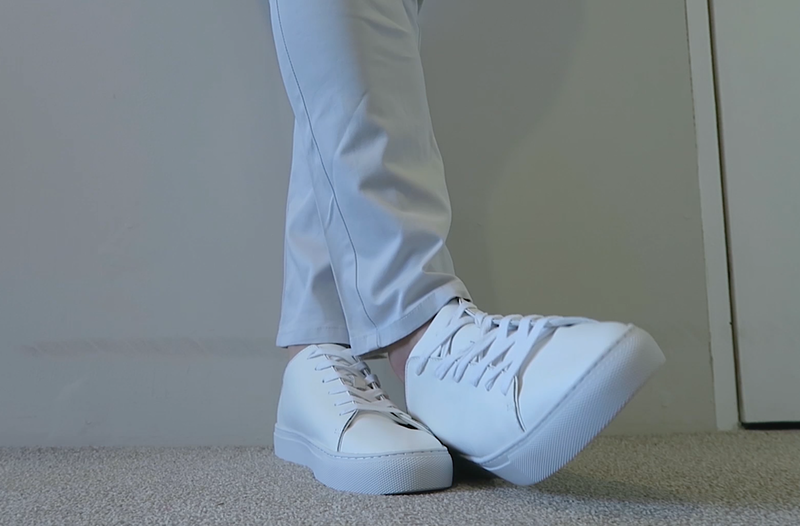 Are you looking for a pair of white sneakers to wear with formal trousers instead of shoes? Or are you looking for something to throw on at the weekends? What sneakers we choose all comes down to personal preference, and more importantly personal style. As with any wardrobe essential, white sneakers can be found online and offline in many places. You can walk from one high street store to the next and have options to choose from. Online, you’ll find thousands to choose from with a few clicks of a button. But what’s best for you? Personally, with the budget of £50 I found finding a good pair of white sneakers in a store difficult. There were a lot to choose from, and a lot I was happy with but they all exceeded the budget of £50. A pair from Cos were perfect but were priced at £79, Stan Smiths and a pair from Reiss were also over budget. What I did find for under £50 lacked in quality. A pair from H&M that looked good online, in person, lacked quality. The sole was rubber, the stitching was loose and I just knew that they’d only last a few months before I’d be hunting for another pair. Shopping online meant I could find the pair I wanted within budget. Using websites like Shopstyle.co.uk allow you to filter through the top retailers, looking at everything available on the market. A quick search for white sneakers, filtered to under £50 gave me over 100 options to choose from. There was a lot that didn’t fit what I needed, but I found a few options to shortlist. In the end it came down to 2 pairs, one from BOEMOS and the other from Mango Man. At first the pair from BOEMOS seemed to be the better choice due to them being made in Italy and also me preferring the detailing on them… But I wasn’t able to buy them as they’d run out of stock! Therefore I reverted to the pair from Mango Man, and to be honest things I’ve bought in the past from Mango Man I’ve been impressed with. 3 days later… they were here. At first glance the white sneakers were different from the pairs I’d had before. They seemed to be a stronger leather, and were more rigid than previous pairs. The quality looked good for the price, and I paid close attention to the stitching which seemed to be high quality. On first wear they weren’t as comfortable as previous pairs. The stronger leather made them less comfortable to wear but wearing them with a variety of trousers showed just how versatile they were. They looked good with grey wool trousers, chinos and jeans. One thing that did come to mind though was how white they were. With my track record, I knew I had to do something extra to keep these clean. The white leather and minimal design meant that any dirt, scuff or wear would show quite easily. 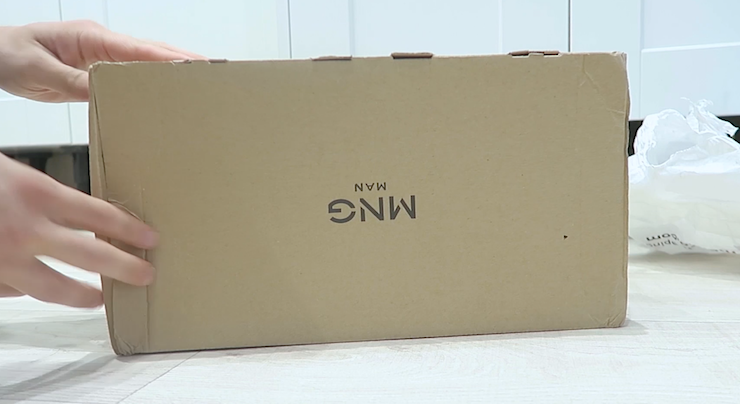 A quick little search on YouTube led me to a video, a video that gave me all the insight I needed to keep my white sneakers clean! For under £50 I was pleased with the overall quality, and after wearing them for a couple of times they started to also become more comfortable. I did spill coffee on them within the first week though, but that Mr Porter video helped me take care of that. Finding a good pair of white sneakers for under £50 proved more difficult than I first thought. I expected to hit the high street and find a good pair, but anything under £50 lacked in quality and the only sneakers I wanted were over budget. Putting a bit of thought into the purchase process first by looking at what white sneakers people recommended helped too. It saved me time, it helped me make a better decision and shopping online meant I could save money but still get quality. 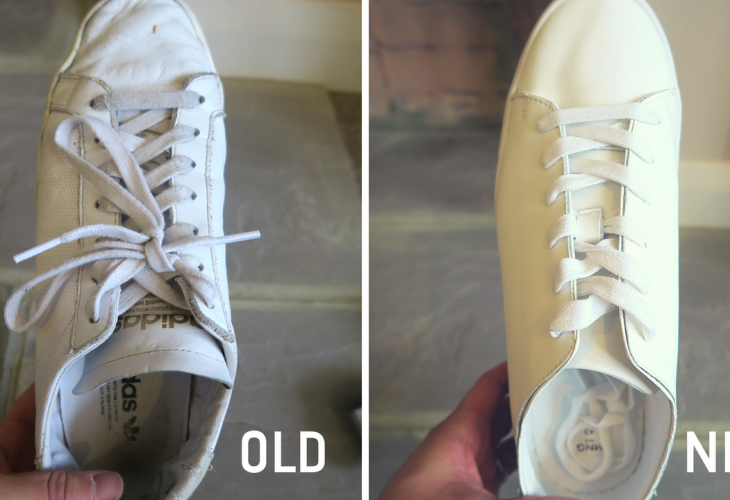 Looking back at how I treated my old white sneakers also reminded me how important care is. We spend money we work hard to make on clothing which once we own, we neglect taking care of. So this time, I’m holding myself accountable to only wear these sneakers when the occasion warrants it and to keep them clean at all times. In summary, I’m happy with the purchase. But what are your favourite white sneakers for under £50? You can shop the pair featured in the video and in this article here. Don’t forget for a video every Sunday and for the chance to win something each week, subscribe over on YouTube.